Heat the oil in a large casserole dish. Brown the chicken, a few pieces at a time, until skin is golden on all sides. As each piece is done, lift out onto a plate. Turn the heat down and add the bacon. Cook gently so some of the fat melts into the pan and keep going until the bacon crisps. 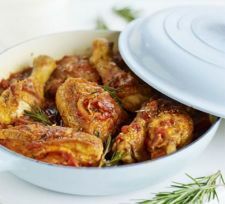 Lift out with a slotted spoon and put with the chicken pieces, then add the onions and rosemary to the casserole. Fry for 5-10 mins until the onions have softened, then return the chicken and bacon, along with the tomatoes, vinegar, sugar, stock and seasoning. Bring to a simmer, cover and cook for 40-50 mins until the chicken is tender – check one of the thigh or leg joints as they will take longer to cook. Stir in the parsley, if using, check the seasoning again and serve with mash, pasta or rice if eating straight away. Otherwise, cool and chill for up to 24 hrs. Or freeze for up to 3 months. Defrost overnight in the fridge, then bring out to room temperature the next day if not fully defrosted. Tip back into a saucepan, bring to a gentle simmer, then cover and gently cook until chicken is piping hot. Don’t boil or the chicken may toughen up.